I am sure you have heard me mention that I have super sensitive skin and can only use Natural and Organic Skin Care and Makeup and then have to be really careful what natural ingredients are included. Allergies can be a pain!! 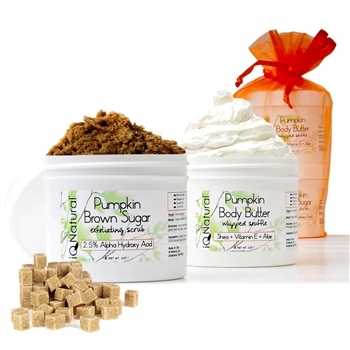 I really love to use body scrubs and saw that this has my favorite PUMPKIN You know I want to try this one-and the set is currently on sale! "iQ Natural's focus on certified Organic, high concentration active-naturals and holistic plant based ingredients has given clients both professional and personal use, a product with highly effective and health driven results for over 14 years. Results that can be summed up in the vibrant, beautiful, glowing and youthful appearance your nourished skin will emanate. " They also sell Make-up, Skin Care, Bath & Body, Aromatherapy, Hair Care, Tools and Brushes, have free gifts if your purchase a certain amount and they even sell wholesale. I was browsing their Makeup selection and saw this shadow collection--I LOVE it and want it!! You really have to go in to see all this company has to offer and all natural!! I may receive product or monetary compensation for this blog post. All opinions expressed are my own honest opinions. For more information please check my Disclosure Statement. Our giveaways are in no way sponsored or promoted by Facebook. I love anything pumpkin! This looks awesome. Thanks for sharing! Thank you for a review of products and a brand I have never heard of! I have very sensitive skin and need to be aware of what comes in contact with me! I think I would like pumpkin on my skin! Pumpkin! The minute I read that word I traveled back to a Bath & Body works store in the fall. Ahh the scent does not show up enough as it should in the summer time. I think I will look into this company thanks to your recommendation. I would like to begin using organic products on my skin after hearing about some of the ingredients in the Obagi products I use now. I really like anything I've used that is made with pumpkin. It really does seem like they have a lot to offer. I like the pumpkin set you featured! I went to the urgent care yesterday because I thought that I have had pink eye for the last week but the Rx wasnt working. The doctor suggested that I stop using eye make up for awhile to see if it is allergies. I am going to check out these natural products and get new eye make up that will be better for me! You had me at Natural, and Pumpkin. I have been trying really hard to make sure everything I put on my skin is organic and natural. You can't go wrong with that. I've never tried a body scrub before. My wife really loves pumpkin stuff as well! I'll have to show this to her. I don't wear makeup, but my daughter does. She only uses natural and organic products. I will have to look into this brand a bit. We prefer organic in our home. I am a huge fan of pumpkin also. I love trying out new beauty products. I can't wait to try these. Sounds like amazing product line. The flavors sound good enough to eat! What great looking products. I have sensitive skin and have to be careful with what I use too. I'll be checking IQ Naturals out for sure now. I haven't done a body scrub in a long time! Pumpkin sounds like it would be a very pleasant experience. I'll have to check out this brand! A body scrub always makes my skin feel so much better. This looks like an amazing line! I'm also a big fan of anything pumpkin so I'll have to check this out for sure! The iQ Natural products sound totally amazing. 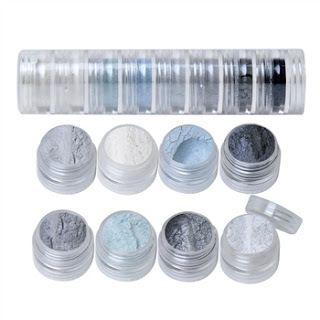 I would love to try the eye shadows which are totally awesome colors in this set. The thing I love is that they use all natural plant base products. Thanks for sharing. I think I would want to eat it. It looks amazing for the body and I loved the scrubs I am always in a need of those for my showers. I also have very sensitive skin but have not heard of this brand! It is great that they have awsome skin care and makeup that won't irritate my skin!! This sounds lie a wonderful product. Nothing beats organic products.